Fully equipped service vehicles for medium and heavy duty truck and trailer repair. 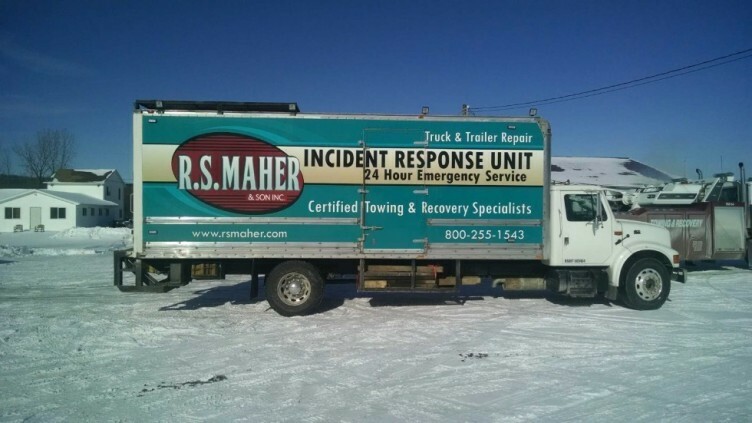 24-hour road side service available for winch outs, rollovers and recovery as well as local and long distance towing. Our fleet includes flatbed, refrigerated vans, dry vans, walking floors, and step deck trailers. R.S. Maher & Son Inc. is located in Bliss, NY. The company began hauling milk in 1950 with one truck. Three generations have since grown the business to include a fleet of over 20 trucks and trailers servicing the Eastern United States and beyond. Our services have expanded to include emergency road-side service, towing & recovery and medium-heavy duty truck repair. Customer satisfaction is our #1 priority. We provide quality services in a timely manner to exceed our customer's expectations. With a loyal staff and over 60 years of assisting the transportation industry, we are experienced in handling any emergency situation. We are here for you 24-hours a day, 7 days a week for all services including towing & recovery, emergency service and truck & trailer repair.